Since the first snowmobile hit the snow in 1927, more than 200 brands have appeared in the United States and Canada with the majority arriving from 1965 to 1972. That number quickly dropped in the 1970s and 80s to only four manufacturers, the same number that remains today. Vintage Flashback will feature some of those “lost” brands. So who built the first snowmobile? Ski Doo? Polaris? Arctic Cat? Surprisingly, the answer is none of those. The first snowmobile ever produced was the Eliason Motor Toboggan, built by Carl Eliason during 1924 in Sayner, WI. The machine looked very much like an old wooden toboggan with a track and engine. After producing a handful of machines in his garage over a three-year period, Eliason applied for and received the first patent ever issued for a “snowmobile” in 1927. Officially the machine was named The Eliason Motor Toboggan, but was affectionately called “The Frigid Flyer” by most and featured an Excelsior motorcycle engine. By 1940 Eliason was struggling to keep up with demand and sold his interests and patent to the Four Wheel Drive Auto Company but stayed on as a consultant. Production was moved to Clintonville, WI, and the Excelsior powerplant was dropped in favor of an Indian Motorcycle Engine. The owners of the new company did not like the name “Motor Toboggan” and an employee came up with the term “snowmobile” for the very first time. Had he not coined the term, we might all be motor tobogganers. in 1951 the company introduced a rear engine model which featured a front cab and windshield for the first time. The engine used in this new model was an 8.5 hp Briggs & Stratton. As the ‘50s came to a close the Eliason was no longer the only player in the market as Ski-Doo began producing a personal snowmobile after years of building large snowcoaches, and brothers Edgar and Allen Hetten released their Polaris snowmobile. By 1964 sales had dwindled and the Eliason brand was sold to an investor who produced only 24 machines before closing the doors on the brand forever. 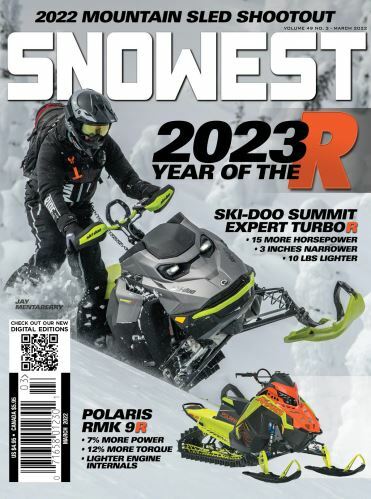 Over the next decade more than 200 manufacturers would try their hand at producing snowmobiles for the masses. Nearly every company in the U.S. and Canada would give it a go before failing or ending production. From the four current manufacturers that survived have come machines vastly different from those produced by Carl Eliason back in the Roaring 20s, and that’s a good thing, unless you want to ride with four of your best buddies, on the same sled, and call yourself a motor tobogganer. —Dustin Sweeten, owner of the Sweeten Snowmobile Museum in Lindon, UT.